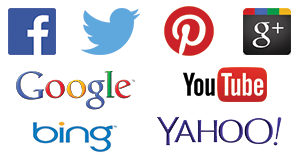 I’ve got a plugin recommendation for you if you’re a social media junkie like me. This plugin will save you time and effort and help you promote your blogposts. Remember back a few posts where I showed you a few ways you could promote your blogposts and invite people to check out your website? One of the ways you can invite people to check out your posts is by sharing them in various social networks. One of my favorite networks for this is Twitter. Using Twitter to promote blog posts is like listening to the radio. The problem with Twitter is that there is so much going on that people tend to miss your tweets. Twitter is like the radio, think about when you listen to the radio. You only get to hear the song playing at that time. You can’t really rewind the radio, or listen to what was broadcasted earlier; instead the station replays the songs every 4 to 12 hours. The playlist changes slowly over the next few weeks and months. So this plugin does something a little bit similar to that. The plugin is called Evergreen Post Tweeter. It is based on an older plugin called Tweet Old Post, but it was modified and enhanced by @tomewer. It’s sole purpose is to promote your posts on a regular basis. You can download it from the WordPress.org repo here, or just search for it through your dashboard and install it directly. The way that Evergreen Post Tweeter works is simple. You set up which posts you want to add by choosing the categories and tags that are available. You then setup a schedule for the tweets to go out and voila!
. It take a post that matches your selected categories or tags and send it out to your twitter account. This is just like the radio station I mentioned earlier where the songs get replayed every so often. In order for this to work, you’ll need to connect your twitter account. This is really simple to do. Simply, open up a new tab or window on your browser and login to your Twitter account. Come back to the tab where you have the Evergreen Post Tweeter settings on your blog and click on Sign in with Twitter. The next screen will ask you to confirm that you want to allow the application to have access to your account. You need this for the plugin to work, so click on Authorize app. 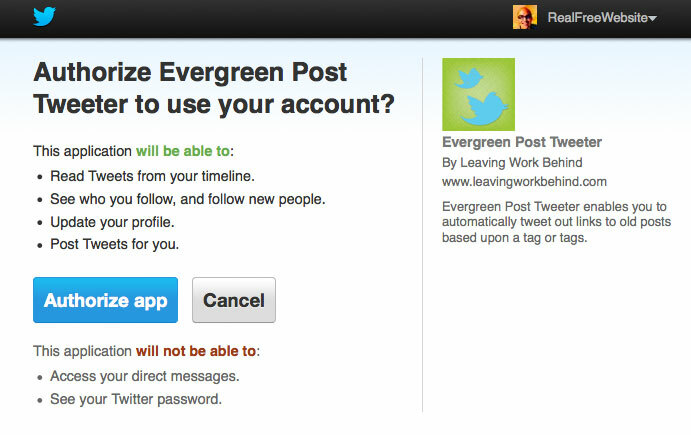 If all goes according to plan then you’ll be taken back to the Evergreen Post Tweeter settings screen and your account will show as connected. You must authorize the plugin to connect to your twitter account. For the time being, you can only connect one twitter account. If you need to change to a different account, click on the button that will de-authorize your account and repeat the process with the right account. Setting up the schedule is easy and intuitive, click on the days that you want the plugin to work, then add times. The plugin will take it from there. Don’t forget to save your settings! Once in a while, as your blog grows and you add more categories and tags, make sure you come back to the settings page to adjust that. You’ll need to add new categories and tags created after the initial setup of the plugin. A word of advice. One thing to keep in mind is that you should setup your schedule with moderation in mind. Twitter is known for suspending accounts that repeat tweets too much or too frequently so make sure your settings correspond the number of posts you have chosen to tweet out. If you only have a few posts on your blog, then have the plugin tweet out less often. As you increase your posts you can increase the frequency in the settings. Fantastic find, Oscar! I’m testing it with SoCalHiker.net. Jeff, there is no hard number but Twitter doesn’t like you repeating the same things too often. I would try to figure out what are the chances that a tweet would repeat itself with the timing thresholds you’ve set. Example, if you only have 20 blogposts and you’re set to tweet every two hours, you’re going to start repeating tweets within a day or two. Maybe it would be better to have it every 8 hours or so. This gives you time to interject your own tweets and give Twitter enough time between repeated tweets so they don’t shut down your account. Thank you a lot for your help with the move! Rommel Badua tells you about the great job I did for him, the turnaround on his site was one day.